One of the most interesting results to emerge from planet-hunting surveys is that planets and planetary systems are really diverse. I am trying to understand this diversity by studying the birthplace of planets – disks of gas and dust around young stars that we call “protoplanetary disks”. In particular, I study the chemistry in protoplanetary disks. In this post, I’m going to explain some of the techniques we use to detect and study molecules in protoplanetary disks using ground-based telescopes. In particular, I’m going to discuss the importance of the Doppler shift. To detect molecules, we look for their unique spectral fingerprints. So we use spectrographs, usually on a large telescope like Keck or Gemini Observatory, or the Very Large Telescope. These observations require a lot of photons! But one challenge for these types of observations is that, if we’re observing simple molecules like water, carbon monoxide or methane, for example, these same molecules sit in the earth’s atmosphere and preferentially absorb the very photons we’re trying to detect. This is where Doppler shifts come to the rescue. 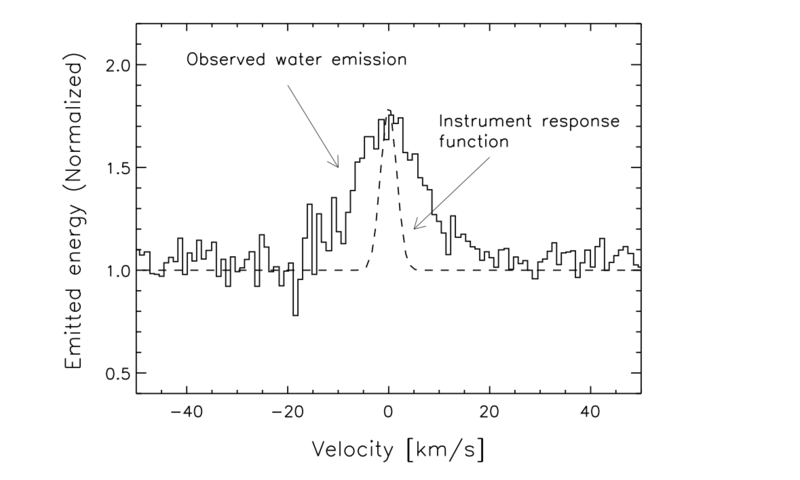 You may be familiar with Doppler shifts in the context of radial velocity searches for planets, in which the periodic Doppler shift in stellar absorption lines is produced by the gravitational pull of an orbiting planet. Recall that Doppler shifts are shifts in wavelength that are produced by relative motions between a source emitting photons, and an observer. If the source and observer are moving towards each other, the source looks blueshifted — its spectrum moves towards shorter wavelengths; if they are moving away from each other, the spectrum looks redshifted, like it has moved to longer wavelengths. In our case, because both the protoplanetary disks and the earth are moving in space, the light emitted by molecules in the disk are seen at earth to be shifted in wavelength. Therefore, the wavelength of light we’re trying to detect is no longer exactly where molecules in our atmosphere want to absorb light. The figure below shows an example of this. The red line shows the percent transmission of light through the earth’s atmosphere as a function of wavelength, as observed at the top of Mauna Kea. Note that at some wavelengths, the transmission is significantly less than 100%, meaning that the atmosphere absorbs a significant fraction of the light it receives from space. These regions are where water vapor molecules in the earth’s atmosphere are sucking up photons. In black is a spectrum of emission from a protoplanetary disk, obtained with the TEXES spectrograph on the Gemini North telescope. 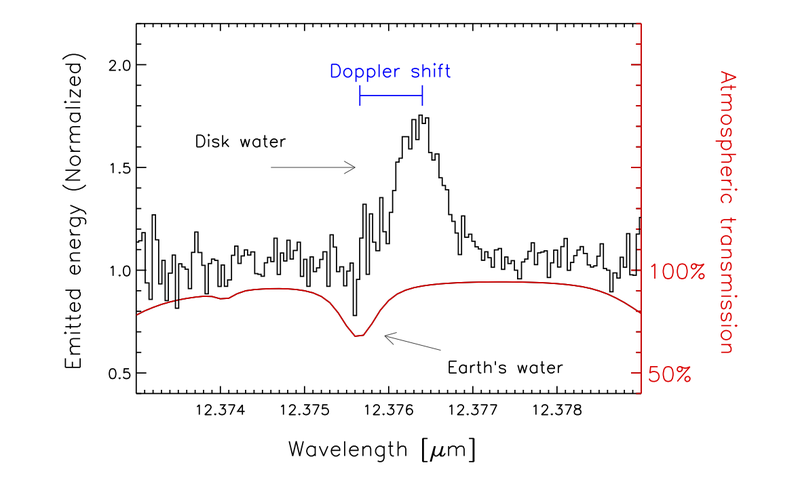 The peak in this spectrum was emitted by water vapor molecules in a protoplanetary disk. Note that it’s shifted relative to the sky absorption line due to the Doppler shift. In this case, the shift of the source line relative to the earth is consistent with a relative velocity of 18 km/s (∼40,000 miles/hour). This Doppler shift wasn’t just obtained by chance. Because it’s the relative motion of the earth and the disk that determines the observed Doppler shift, this shift actually changes throughout the year, as the earth orbits around the sun. 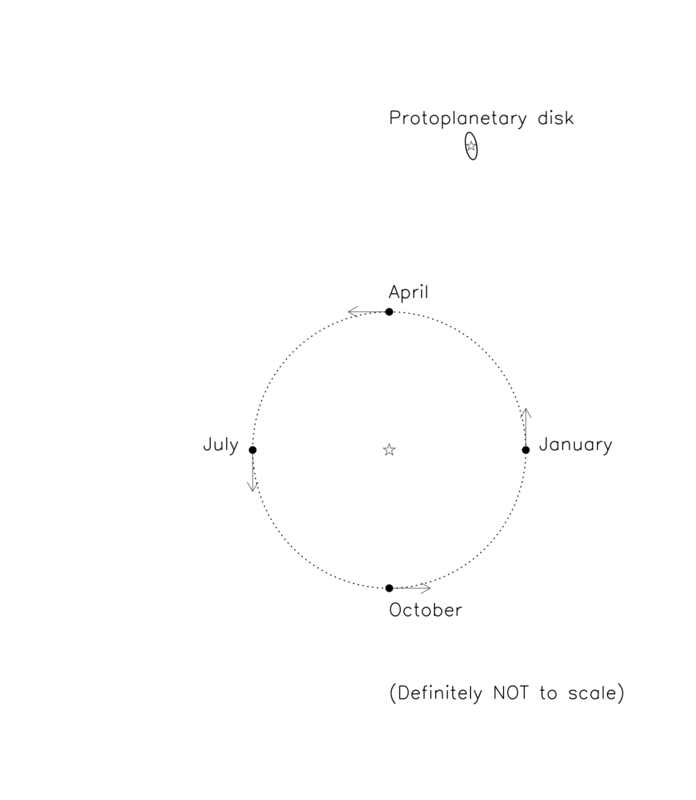 The diagram below is a schematic representing a top-down view of the earth’s orbit, with the location of the Earth at four hypothetical dates, as well as a possible location on the celestial sphere of a protoplanetary disk. Note that while the Earth orbits the sun at a nearly constant speed, the direction of its velocity (represented by the arrows) changes. 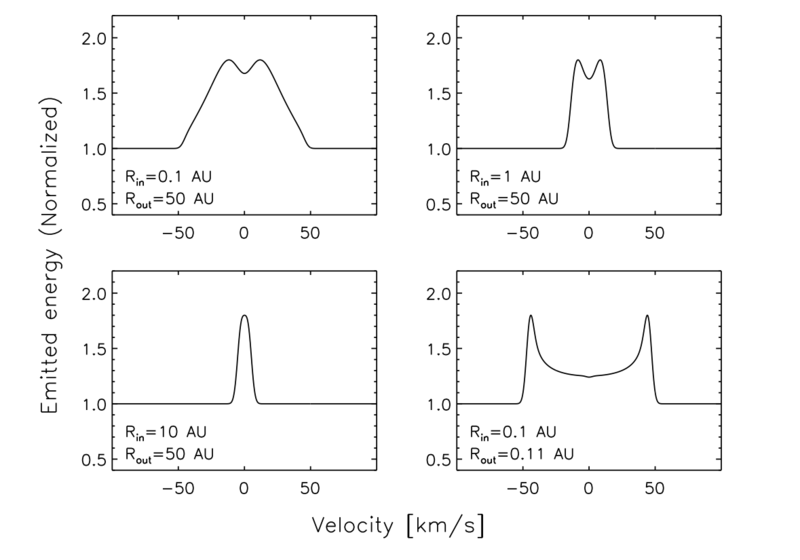 So there are times of the year when the spectrum of this protoplanetary disk is shifted towards longer wavelengths, other times when it is shifted towards shorter wavelengths, and times when it is not shifted at all. Assuming the geometry in this schematic, what time(s) of year might you expect the Doppler shift shown in the first figure? When do you think would be the ideal time(s) of year to plan observations of molecules in this disk? When would be the worst times of year? Once we detect the molecules, what do we learn from them about planet formation? I’ll discuss this in more detail in a future post. But here’s some food for thought. The architecture of the solar system has a very clear division between terrestrial planets (at 1.5 AU and within) and giant planets (at 5 AU and beyond). What might have caused this dichotomy, and should we expect to see it in exo-planetary systems as well?